Used to maintain the health of the grass plant and the structure of the soil. Applied using an irrigation system or by hand, and naturally with rain fall. As required in preparation of pitches and maintaining plant health. 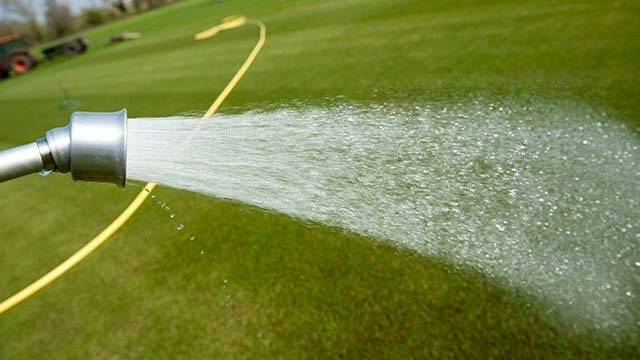 Over watering creates soft playing surface, shallow rooting and the wrong grass species. Under watering can lead to the death of the grass plant. Storage tanks, pumps, hose pipes, mobile sprinklers and automatic irrigation systems. And of course, the good old watering can! If you store water on site have it tested once a year for pH, nutrients and oxygen levels. Consider installing a water harvesting system to make use of rainfall and reduce bills.